Disease, trauma or serious infection may result in extensive bone damage or bone loss which exceeds the body's capacity to repair itself. In such cases, implants are needed to promote satisfactory healing. These may take the form of screws, plates, or rods to immobilise broken bones in the correct alignment, reinforce weak bones or correct skeletal deformities. Similarly, diseased joints can be replaced with prosthetic joints to restore normal, pain-free movement. Despite ongoing medical advances and improvements in materials and procedures, there remains a substantial risk of implanted devices becoming infected. In addition to microbes being introduced into the body during surgery, there is the risk of bacteria transported in the blood from other parts of the body colonising the surface of an implant. 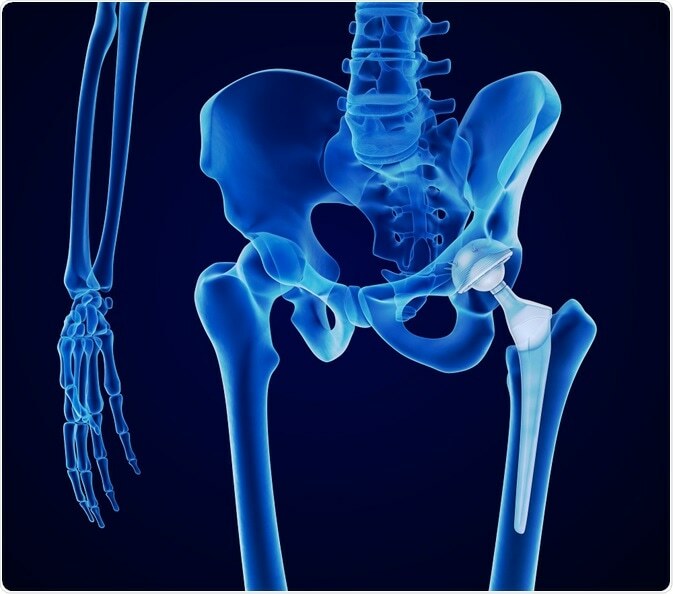 It has been estimated that as many as 2.5% of primary hip and knee replacements and to 10% of joint revision surgeries are complicated by infection.1 Infected implanted devices represent a significant clinical challenge. Antibiotics continue to be the mainstay strategy for both the prevention and treatment of implant infections. However, the power of antibiotics in the fight against infection is diminishing as many strains of potent bacteria are developing resistance to even the strongest antibiotics. Consequently, the risk of implanted devices becoming infected is on the rise and researchers are investigating novel ways to reduce such infections. It was therefore proposed that making the surface of implants unsuitable for bacterial colonisation would dramatically lower infection rates. This can be achieved by coating the implant with bioactive glass. Initial technical challenges have been overcome and a range of titanium implants have been successfully coated with bioactive glass.12 Clinical use of implants coated with bioactive glass has given promising results in both orthopaedic and dental applications. There was no evidence of the coated implants causing any adverse effects or inflammatory response in the surrounding tissue. Mo-Sci produces high quality bioactive glass powders, the precise composition of which can be tailored to meet specific requirements. They produce bioactive glass suitable for coating orthopaedic and dental implants. The advantage of ions and nanoparticles over antibiotics is that their efficacy depends solely on contact with the bacterial cell wall; they do not need to enter the cell. Consequently, their lethal effect is delivered irrespective of the specific genetics of the target bacteria and is unaffected by the resistance mechanisms used by bacteria to evade antibiotics. Infection of medical implants is an increasingly serious clinical and socioeconomic burden. Furthermore, the situation is likely to worsen with the increasing prevalence of bacteria with multi-drug resistance. Bioactive glass has inherent antimicrobial activity and does not elicit a toxic e response to surrounding tissues. Consequently, coating implants with bioactive glass represents an attractive option for reducing the risk of infection. The antimicrobial properties of bioactive glass can be further enhanced by loading it with antimicrobial agents, such as ions or antibacterial nanoparticles. Such a strategy would reduce the need for prophylactic antibiotic use, whereby protecting against the development of further strains of antibiotic-resistant bacteria. Since bacteria cannot adapt to the hostile environment created by bioactive glass or its biofilm-resistant surface, they are unlikely to develop resistance to the antimicrobial action of bioactive glass. In addition, the coating of implants with bioactive glass has been shown to speed up the fusion of the implant with bone, accelerating a patient's recovery. The use of bioactive glass, either alone or doped with antimicrobial agents, as a coating for orthopaedic and dental implants is thus likely to improve the success rate and enhance patient outcomes across a range of reparative and restorative surgeries by promoting rapid healing and minimizing the occurrence of infection. Lentino JR. Prosthetic joint infections: Bane of orthopedists, challenge for infectious disease specialists. Clin Infect Dis. 2003;36:1157–61. doi: 10.1086/374554. Rahaman MN, et al. Bioactive glass in tissue engineering. Acta Biomaterialia 2011;7:2355‑2373. Ottomeyer M, et al. Broad-Spectrum Antibacterial Characteristics of Four Novel Borate-Based Bioactive Glasses. Advances in Microbiology 2016;6:776‑787. Zhang D, et al. Factors Controlling Antibacterial Properties of Bioactive Glasses. Key Engineering Materials 2007;330-332:173‑176. Drago L, et al. Recent Evidence on Bioactive Glass Antimicrobial and Antibiofilm Activity: A Mini-Review Materials 2018;11:326‑337. Misra SK, et al. Poly(3-hydroxybutyrate) multifunctional composite scaffolds for tissue engineering applications. Biomaterials 2010;31:2806–2815. Rivadeneira J, et al. In vitro antistaphylococcal effects of a novel 45S5 bioglass/agar-gelatin biocomposite films. J Appl Microbiol 2013;115,604–612. Lopez-Esteban S, et al. Bioactive glass coatings for orthopedic metallic implants. Journal of the European Ceramic Society 2003;23:2921–2930. Mehdikhani-Nahrkhalaji M, et al. Biodegradable nanocomposite coatings accelerate bone healing: In vivo evaluation. Dent Res J (Isfahan). 2015;12(1):89‑99. Chen Q, et al.Cellulose Nanocrystals--Bioactive Glass Hybrid Coating as Bone Substitutes by Electrophoretic Co-deposition: In Situ Control of Mineralization of Bioactive Glass and Enhancement of Osteoblastic Performance. ACS Appl Mater Interfaces. 2015 Nov 11;7(44):24715‑25. van Oirschot BA, et al. Comparison of different surface modifications for titanium implants installed into the goat iliac crest. Clin Oral Implants Res. 2016;27(2):e57‑67. Kaur G, et al D. Review and the state of the art: Sol–gel and melt quenched bioactive glasses for tissue engineering. J Biomed Mater Res B Appl Biomater 2016;104, 1248–1275. Karwowska E. Antibacterial potential of nanocomposite-based materials – a short review. Nanotechnology Reviews 2016;6(2):243‑254. Rivadeneira J and Gorustovich J. Bioactive glasses as delivery systems for antimicrobial agents. Journal of Applied Microbiology 2016;122, 1424--1437.